IN CANADA, the courts generally take a dim view of market participants who fail in their duty to bargain in good faith. 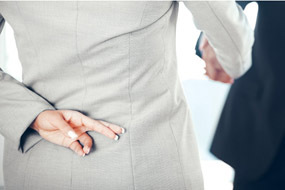 Not surprisingly, the practice of lying in wait, or “sandbagging,” arouses strong feelings. Sandbagging in mergers and acquisitions refers to situations in which a buyer may agree to a transaction despite knowing that one or more of the claims made by the seller is false, with the intention of potentially suing for damages once the deal has closed. Some say such behaviour is the opposite of good faith, but others aren’t so sure. “The term sounds pejorative, and to a layperson it might not ever sound fair that a buyer of a business can sandbag the seller,” says Patricia Olasker, a partner at Davies Ward Phillips & Vineberg LLP in Toronto. In the course of a deal, the vendor typically provides a list of representations and warranties regarding the asset up for sale, plus some sort of indemnity for the buyer if one of those “reps and warranties” turns out to be untrue. The idea is to protect buyers, but according to critics, sandbagging transforms it into something else entirely. Imagine you’re about to purchase a home. In the course of your inspection of the property you discover the building contains a prohibited insulation product contrary to the vendor’s statement. But instead of raising the issue with the vendor and renegotiating the price, you go ahead with the deal and sue the vendor for misrepresentation. Not surprisingly, it’s vendors who are the most critical of sandbagging, experts say. To the vendor, the buyer is being disingenuous about their level of knowledge. Sandbagging has even been described as “weaponizing” the closing process. Others describe it as “waiting in the weeds.” But we need to take a step back to properly understand what’s going on. According to Olasker, “the issue is much more nuanced than [it is sometimes portrayed] and has to be seen as part of an overall negotiation between buyer and seller.” Negotiations between buyer and seller, including sandbagging strategies, are always about allocation of risk, she says. Both sides want to protect themselves from potential losses. Sandbagging is simply an aspect of that. To Olasker’s point, sandbagging is hardly a new phenomenon. Market participants concerned that sandbagging may become an issue typically protect themselves by including pro- or anti-sandbagging clauses in the agreement. An example of the former might stipulate that the buyer cannot be precluded from launching a claim based on foreknowledge about the truth of the seller’s reps and warranties. By contrast, an anti-sandbagging clause might seek to limit or prevent legal action based on foreknowledge. Such discussions become part of the overall negotiations around the final agreement, says Wright. For many lawyers, this is perhaps the clearest illustration of the legitimacy of sandbagging as something that needs to be seen as part of the overall deal framework. “Sandbagging is just one of a laundry list of significant transaction points that will be negotiated in a typical M&A transaction,” says Brent Kraus, a partner and co-head of capital markets and M&A at Bennett Jones LLP. “And different parties will put different weights on different trade-offs in the course of a negotiation.” In the end it becomes a bargaining chip that either enters the contract or is conceded. “My view is that sophisticated parties should be free to transact as they agree on this item and it’s not really something that should be legislated one way or another,” says Kraus. Simply put, market participants are grownups; they should be left to deal whatever issues arise, including sandbagging, as they see fit. Proponents of this approach — and there are many — make the case that not only are negotiations around sandbagging integral to M&A, they are often key to a deal that works for both sides. Experts such as Kraus say they help shine a light on the broader risks of a deal from both sides’ perspectives. By simply raising the issue of sandbagging, players get a clearer view of potential concerns from the point of view of those sitting opposite at the bargaining table, says Kraus. Interestingly, parties will often raise the topic but in the end opt to leave out any pro- or anti-sandbagging language, having sufficiently explored the territory to satisfy themselves. Broaching the topic forces players to hone in quickly on key aspects, establishing for themselves what the party on the other side of the table does or does not know, says Wright. For example, if the vendor proposes anti-sandbagging language, that compels the buyer to ask, what are you worried about? What do you know that I don’t? The same is true if the buyer asks for pro-sandbagging language. The key point is that a discussion is sparked, and as a result both sides benefit from increased transparency. Still, there are negatives. Critics worry it’s not fair to put most of the onus for full disclosure on the vendor, while leaving the buyer mostly free of such obligations. They also make the case that anti-sandbagging provisions may cause buyers to devote less energy to the normal due diligence process conducted before any acquisition as a way to fend off potential accusations that they knew something was wrong before the closing. One unintended consequence, they say, is that more deals might end up in court. As far as the courts are concerned, there is limited guidance on the issue. However, in general Canadian courts rely on expectations of “good faith” between market participants — in other words, as long as players are truthful and fair in their dealings, courts are willing to go along. “It would be nice to have more guidance from the court, because it is a matter of common law and it is the courts who make the law,” says Wright. Many lawyers feel that’s the right approach. “It’s not really something that should be legislated one way or another. I think the current system, which is really freedom of contract and subject to the parties’ negotiations, works very well,” says Kraus. There is no question that market participants are giving the issue more attention. In recent years there has been a steady rise in the proportion of deals that include a sandbagging clause. Studies suggest the percentage of deals with sandbagging clauses — both anti or pro — is roughly half compared with those that remain silent. According to a 2016 report on Canadian M&A by the American Bar Association, 31 per cent of deals in this country include pro-sandbagging clauses while 15 per cent contain anti-sandbagging clauses; 54 per cent are silent on the issue. So it’s almost evenly split. When it comes to sandbagging language in an agreement, the courts tend to accept the objective intent of the parties, says Kraus. “Once you reach court, the real question is an evidentiary one as to what exact knowledge did the person have or not have,” he says. The bottom line is that market participants are well advised to consider carefully the use anti- or pro-sandbagging language in their deals. Even if they ultimately decide to remain silent, simply talking about it is a means of boosting transparency for both buyer and seller.